Exerts from Chapter 2, Prison Gangs in America, by Gabriel C. Morales. This prison gang started in the late 1950's at DVI. It was originally made up of Mexican American inmates from several different varrios, many who came from East L.A. It quickly established a reputation for violence and became greatly feared by other inmates. It is also known as "La EME", Spanish for the letter "M". Joe Morgan while a powerful figurehead for many years was not one of the founders, he did not join until much later. While the vast majority of its membership was from Southern California it does have members who are not from there. They call each other Carnales or Emeros (Mexican Mafia made members). The EME was engaged in bloody battles with the rival Nuestra Familia from 1968 to 1972. It had escalated at San Quentin Prison in September, 1968, during a fight over a pair of shoes which belonged to an inmate who was from San Jose in Northern California named Hector "Mad Dog" Padilla. The shoes were in possession by an EME member named Robert "Robot" Salas who was from a Southern California-East L.A. varrio called "Hazard". In the movie “American Me” produced by Edward James Olmos, the main character he plays “Santana” gets killed by his own people. This didn’t happen and brought a lot of heat on Olmos. Three film Advisors from the Hazard barrio of East L.A. were killed. Some of the follow-up info on the movie and gang violence came out in Olmo's documentary "Lives in Hazard". Since the September, 1968, “Shoe War”, dozens had been hit or killed on both sides. This four year blood feud finally convinced CDC to arrange “Peace” Talks” between the two prison gangs after an NF boxer from Compton, CA, by the name of “Fast Eddie” Valdez wrote Mexican Mafia leader “Chy” Cadena a letter on 9/16/72 the 4th Anniversary of the war. Since NF Leader John “Juan/Lips” Valdez was out of commission due to an earlier EME hit on him at CIM, Frank “Joker” Mendoza was the next main NF Spokesman to be dealt with. Cadena was housed at Folsom Prison and was pulled down to CIM-Chino Palm Hall for peace talks in late October, 1972, with Mendoza. Cadena proposed that there be an Inmate Governing Body consisting of 12 Reps for both EME and NF factions with one Rep at major CDC institutions “to lead the road to liberation” for Chicano Inmates (Pintos). Unfortunately, Cadena’s pleas for EME to cease fire did not work. The violence was now out of Cadena’s control. On December 12, 1972, just days before the peace talks, Nuestra Familia member Mike Nolan was killed by La EME at San Quentin. On December 15, 1972, brothers Santos Aranda-Cruz and Ernie Aranda were stabbed by EME members at Chino Prison in a sally port leading to the yard at CIM. This was the final straw and the NF swore revenge! As the official CDC Reports show, Cadena did not walk calmly to his death, but was surprise attacked, and out flanked. On December 17, 1972, during afternoon release at approximately 1305 hrs. (1:05 PM), Rodolfo "Cheyenne" Cadena was attacked on the second tier in Palm Hall (not the third tier), he was stabbed over 50 times and thrown over the tier by NF Members “Joker” Mendoza and “Apple” Colon. NF member Refugio “Tiny” Contreras jumped on Cadena after he hit the 1st tier, stabbed him some more, and took Cadena’s watch as a personal prize. Others involved were NF Eddie A. “Crackers” Vindiola from Fresno, Hector “Mad Dog” Padilla from San Jose, CA, (he did not die in the “Shoe War”), and Joe “Leakioso” Varela-Hernandez from Salinas, CA. EME bodyguard Gilbert Sandoval rushed to Cadena’s aid, was also stabbed and thrown over the tier. Sandoval suffered severe head injuries and was taken to USC Medical Center. Cadena was soon pronounced dead…this is another reason why 13’s fight 14’s today! Surenos will often fight each other on the streets of L.A., but will band together in prison. They do not all join the Mexican Mafia. In fact, the EME is a very small group compared to Surenos, only the most violent and loyal Surenos will be given consideration for membership. The EME has been the subject of several RICO trials which has disrupted operations somewhat. The Texas Mexican Mafia or Mexikanemi is a totally different group. 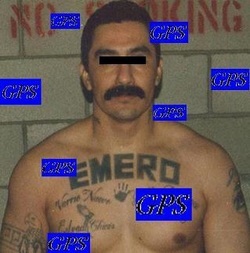 There are other gangs in the U.S. that may call themselves Mexican Mafia, but are not connected with the CA group.